The primary objective of this exercise is to help students learn to recognize finite verbs. There are, however, at least four different ways in which to use them, each of which has advantages and disadvantages. Simply give the students the texts with the blanks and have them think of verbs that make sense. This option has the advantage of being a vocabulary, as well as a grammar exercise. I put the first two exercises (above) in the Fourth Grade Basic Workbook. The first has no time allocated for homework because I suggest that it be done as a group in class. Don't be satisfied with the first verb that is offered for each blank. Instead, create with the class a list of verbs that might fit each blank, briefly discussing how each verb offered would add to the vividness of the text. Having done one exercise in this way in class, you can assign another exercise for homework and then discuss in class the various verbs that the students thought of. In addition to having the students fill in the blanks, you could also have them place parentheses around each prepositional phrase. If they are still having problems identifying such phrases, this might be a good idea, but it will require more time, both in and out of class. Once the students have done one or more of these exercises, have each student create one. They select a short passage that interests them, and then they copy it, double-spaced, preferably in ink, leaving blanks in place of the verbs. This exercise is more difficult in that the students have to distinguish which words in the text are finite verbs, but it has the advantage of giving the students ownership of the exercise, in effect, making them the "teachers." Use each students exercise at least once by having them trade with each other. Another option is to give students a list of the missing verbs. I have made such a list for "The Tale of Tom Kitten," but, as so often, my exercise is probably too long. The students can simply cross off the verbs as they use them, or, if you want to reuse the lists, you can simply have the students use them as a reference. I am aware of some instructional material that makes little pieces for parts of speech etc., and has the students use these to create sentences, etc. You can try that, of course, but the problem is that pieces are easily lost. The advantage of this option is that it does not require class time for discussion. It may also be good as a supplemental exercise for individual students who are having problems recognizing verbs. But these advantages are also disadvantages in that the students do not need to think about appropriate verbs, and some students may simply use the list to fill in the blanks without even thinking about the fact that they are verbs. 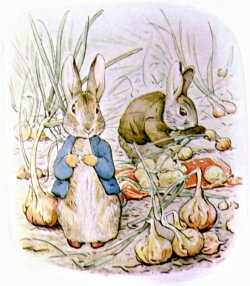 Beatrix Potter for The Tale of Peter Rabbit, London, Frederick Warne, 1902.